During your academic career, you will need to face numerous tests, pass dozens of exams. However, sometimes you might find yourself stuck with a simple exam form like short-answer questions. It might be because of emotional burnout, stress or number of other reasons, but the outcome remains the same - you need professional assistance with preparing your answers. As a form of the exam or online assessment, short-answer task is more common than you might think. Regardless of your academic level, this form of test is considered to be an efficient and easy to grade form. However, many students seem to hate such tasks, as they are extremely time-consuming, require additional research and lots of writing. If you understand that completing this type of work takes all your free time and reduces your sleep, you might be interested in the services provided by EssaysLab.com. A lot of students think that ordering professional help is embarrassment or cheating. Let us bust that myth and tell you more about online writing agencies like ours. First, that you need to keep in mind that services we offer are meant for educational purposes and designed to help you learn and improve your knowledge. Second, they help you save your time and thus, you may focus on studying itself, not to mention having a healthier sleep, for example. And we do not have to tell you how important that is! Some of our clients say that using our services not only helped them get a better result during the exam, but also improved their GPA. As a result, for a reasonable price they got expert help and managed to achieve better academic results. What is the Pricing Policy for Short-Answer Questions? Every price is defined by the basic aspect: number of pages, academic level and deadline. For example, one page of short-answer questions for high school student that needs to be submitted in 11 days will cost $12.99, whereas a college student will be asked to pay $15.99 per the same page. For short answer questions, we calculate the number of pages by dividing the total number of questions by 5. For example, if you have 175 questions in your exam, you will have to order 35 pages. Please note, that with the growing number of pages your chance for getting a lifetime discount is growing (for more detailed information, please check our Discount program). As an online writing agency that provides writing and exam help services in the highly competitive market, we understand that we need to stand off from the crowd. So in order to explain why are we better, we ask you to consider the following information. We employ experts from different countries, but they have to possess excellent knowledge of English, have a Bachelor, Master or Ph.D. degree in certain area of expertise and pass a complex entrance test. We also offer regular further education courses to help them keep up-to-date with the recent changes in academic writing. We understand how important it is for you to keep our cooperation under the radar. So we not only protect your private and sensitive information but have also created a system that protects your identity even from your writer. Every our client will receive professional support from our team, should you have any question regarding prices, deadlines, placing an order or order delivery. You can get in touch by phone (check our Contact page to get the number), e-mail or via live chat that offers round-the-clock assistance. 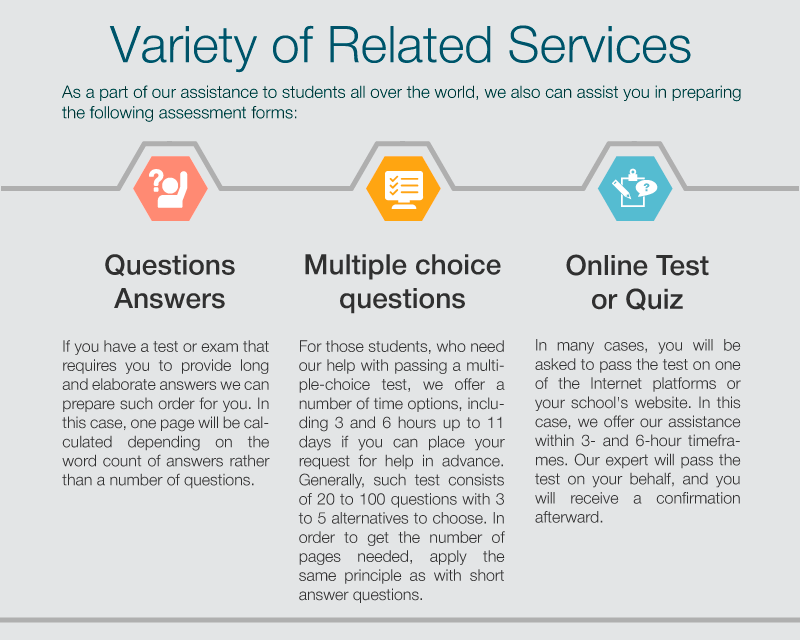 Ordering short-answer questions test help is a simple task that requires less than 10 minutes of your time. You will not only receive qualified help but will also learn more about how easy your life can be once you trust us to take care of your academic assignments. We can handle even the most complicated task in the shortest amount of time. How to Place an Order for Short-Answer Questions? the first thing you need to do is open the order form. You will see that the first section consists of your contact information. We ask our clients to provide a current e-mail address and phone number in case we need to get ahold of you or inform you about the progress. Next, you need to choose the type of assignment and specify the requirements (subject, number of pages) and upload any files that our experts might need. Once you have described the order needed, please proceed with your order and check all the requirements in the second step of the form. Once you are done, pay for your order and let us find the most suitable expert to work on your order. You can stay in touch with your personal expert throughout the whole time, having the full control of the process. Once the deadline is over, you will receive a notification that your order has been completed. You can either download it from your Membership area or get a copy that we will send to your e-mail.